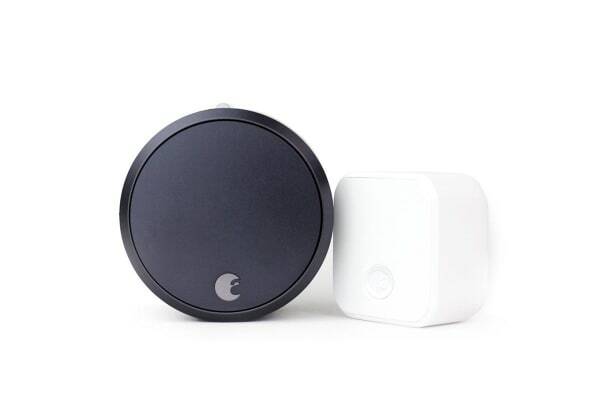 Keep your home safe and secure with the August Smart Lock Pro + Connect, which allows you remotely lock and unlock your door, control keyless access and keep track of who comes and goes. The August Smart Lock Pro + Connect comes equipped with DoorSense and Auto-Lock technologies. Auto-Unlock automatically unlocks your door as you approach your home – you won’t even have to reach for your phone or keys! This technology senses your location, and switches between two modes: Home and Away. When you’re at home, the August app enters Home Mode, and Auto-Unlock will not activate. Once you have travelled more than 200 meters from your home, Auto-Unlock will go into Away Mode until you return. Rest assured knowing that you can control your August Smart Lock Pro from anywhere. While your at home use Bluetooth or your voice to secure your home, and when you’re away connect via Wi-Fi. Expecting guests? Use the keyless access function to provide your friends and family with access to your home when you’re not around! The August Smart Lock Pro is installed on the inside of your door, so your exterior hardware does not change. This smart lock easily retrofit to your existing deadbolt, meaning that you can keep your existing keys and use them at any time. Please note: The August Smart Lock Pro + Connect works with most single-cylinder deadbolts but not mortise, rim cylinder or interconnected locks. Works with most single-cylinder deadbolts. Not mortise, rim cylinder or interconnected locks.